Ryusendo Cave, along with “Akiyoshido Cave” in Yamaguchi Prefecture and “Ryugado Cave” in Kochi Prefecture, is listed as one of the three greatest limestone caves in Japan. These caves have been so-named because the inaugural chairman of the Japan Caving Association, Hiroshi Yamaguchi, focused particularly on investigating these three limestone caves. Also on December 14, 1938, Ryusendo, as “Iwaizumi Wakkutsu (Iwaizumi Spring Cave) and bats”, was designated a historic site, a place of scenic beauty and a natural treasure”. There is a time of the year when the underground lakes look their most beautiful. 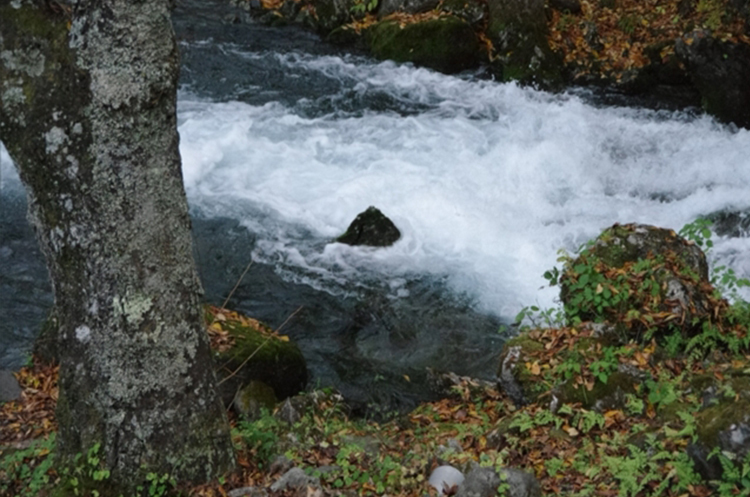 That is the winter season, which is when the water is not disturbed by rainfall. When the water of the underground lakes is swollen by heavy rainfall, or increased snowmelt, etc., the greater flow of water into the lake stirs up the silt, the sunken deposit of white fine particles, and this makes the underground lakes less translucent. Also in winter as the ground freezes, water stops dripping from the cave ceiling, and without ripples on its surface the lake’s water is still and at its most transparent. 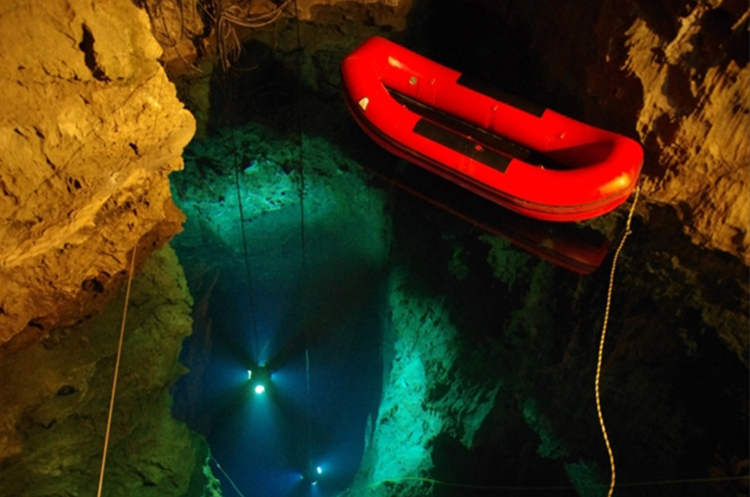 This is why in winter the underground lake becomes so transparent that you cannot tell where the water surface is. Following the tour route, you pass through the Moon Palace twice, once going and once returning. To be viewed on the return trip is a formation of overlapping rocks which has a heart-shape. 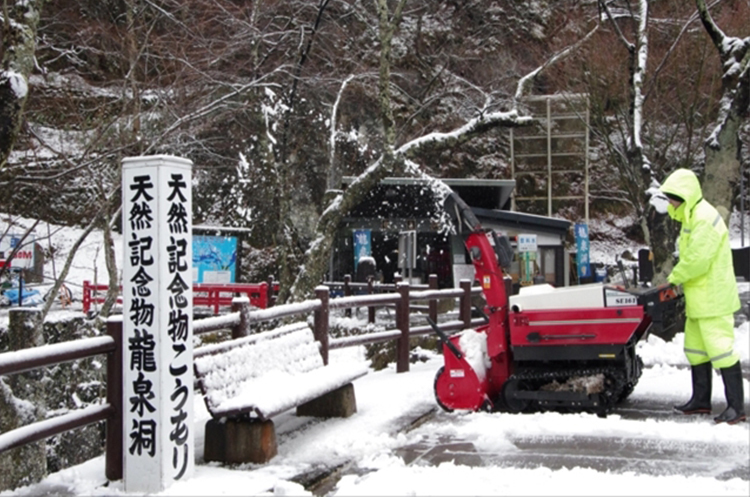 ※ Under the one-way traffic rule, visitors pass this spot once only, on their way into the cave interior. Looking towards the “Kameiwa (Turtle Rock)” when standing near the “Mamori Jishi (Guardian Lion)”, you will see a heart formation, leaning a little to the left. So, do keep an eye open for it! The Cave is the habitat of five varieties of bats: “Rhinolophus ferrumequinum nippon (Greater horseshoe bat)”, “Rhinolophus cornutus cornutus (Little Japanese horseshoe bat), “Myotis macrodactylus (Japanese Large-footed Bat)”, “Murina hilgendorfi (Tube-nosed bat)”, and “Plecotus sacrimontis (Japanese long-eared bat)”. The first two live inside the cave all year round, and the other three live in the woods in summer but live inside the cave in winter. Because bats are nocturnal, they are not easy to see in daytime. However, in winter, they hibernate in the cave and are readily encountered during the tour. While they may be hard to spot initially, you will be pleasantly surprised once your eyes adjust! Often they are hanging just above your head. 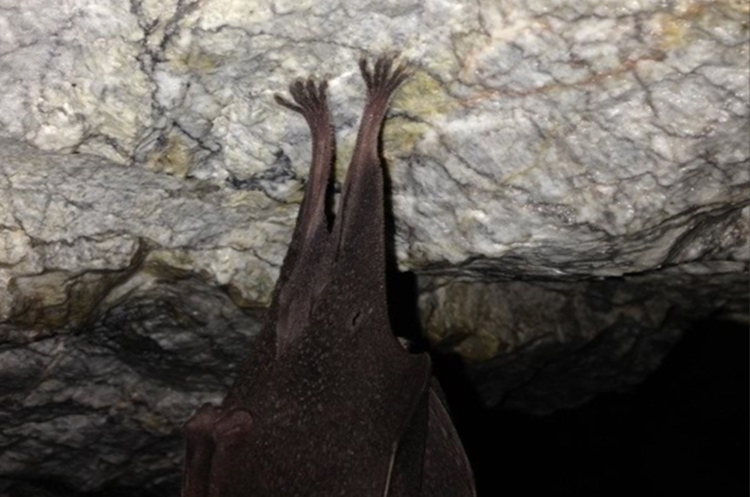 Although hibernating bats may be almost within reach, please be sure to leave them alone so as not to wake them by touching or by flashing a light. Along the tour routes, there are some points where forward and return routes overlap. 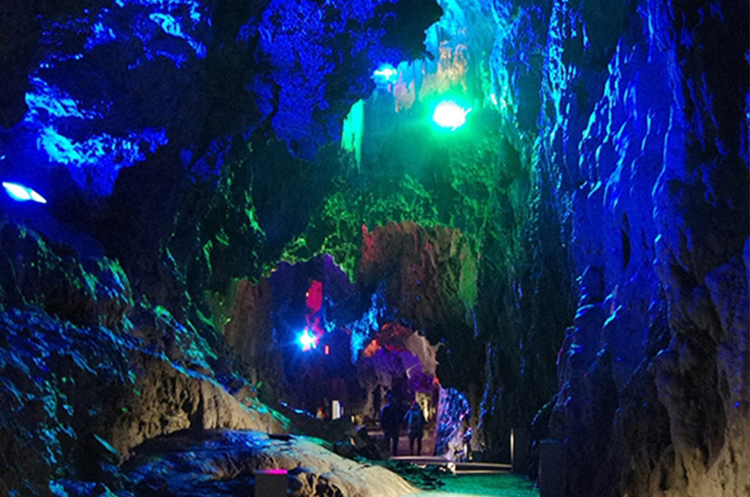 Because of crowds of visitors in the busy period, the cave may become congested. To prevent this congestion, the tour route will be made all one-way, and the exit will be through a temporary tunnel exit near the turning point in the cave. 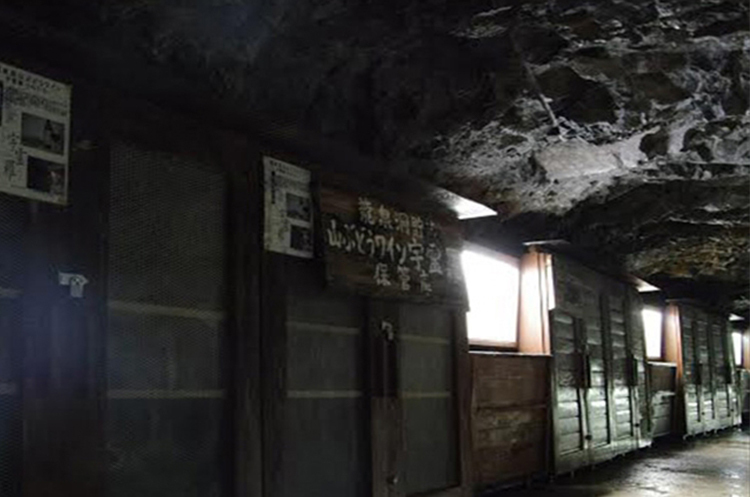 The tunnel is also used as a wine cellar, which stores wine made from Iwaizumi’s wild grapes. Ryusendo Cave is ideal for storing wine because it maintains a constant temperature all year round. This wine is called “U’reira Wine” after the mountain, “Mt. U’reira”, where this Ryusendo Cave is located. The volume of water flowing through Ryusendo Cave via the underground lakes is not always constant. It ismainly affected by the season or the weather. 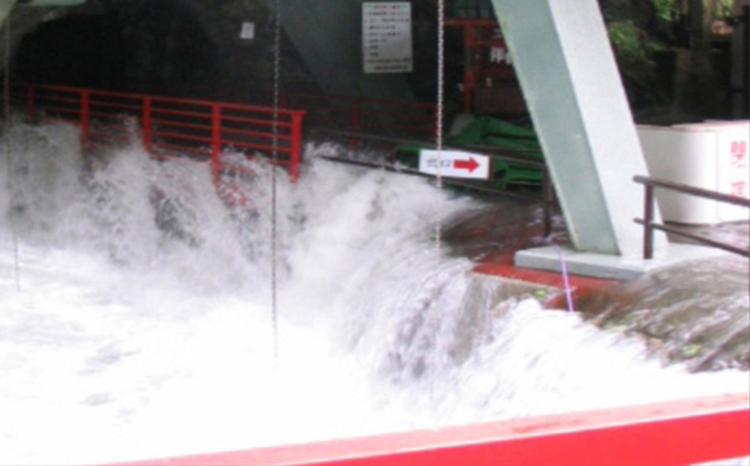 In particular, the cave’s water level can rise at the time of snow-melt, or during the rainy season’s heavy falls and typhoons, or when increasing stream water flows from a faraway source and soaks through the ground directly above the cave and drips down. Although it does not happen so often, when the water rises so high as to submerge the tour route, we may close the cave until it recedes. When the water rises, the underground lakes become temporarily cloudy for a while, due to the distorted reflaction of light by the extra water current and also due to the increased turbidity from the silt, the fine white particulate sediment. However, the stalactites are now wet and shining and look refreshingly more beautiful. 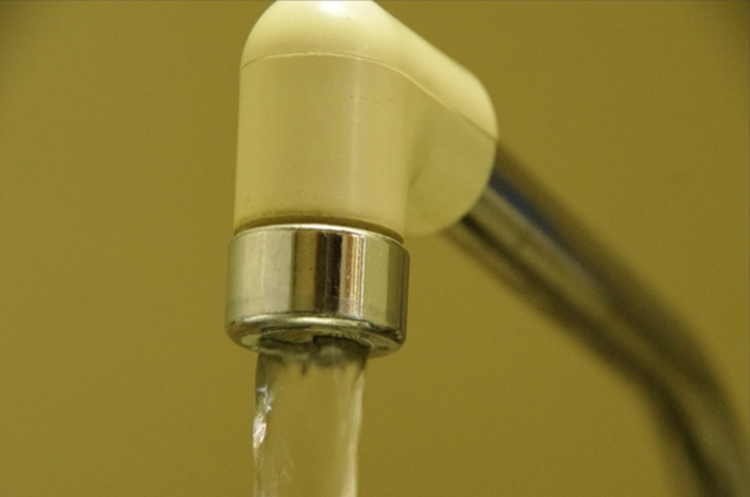 Did you know that whenever you turn on the tap in Iwaizumi, what you get is water from Ryusendo Cave? 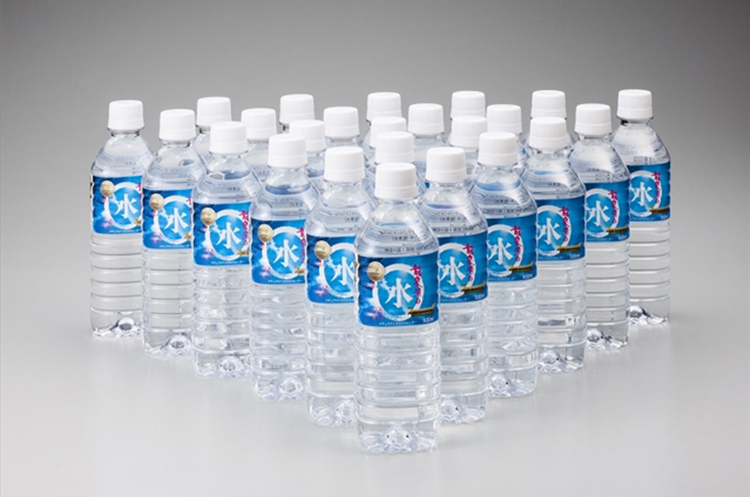 Water from Ryusendo Cave is sold as a bottled product, yet it is the very same as used in everyday life in Iwaizumi. To enhance the water’s transparency, an underwater light is placed within each underwater lake. In 2011, all the lighting was changed to LED lamps to make it eco-friendly. Until then, the heat from direct or indirect lighting often encouraged algae to grow on the cave wall. Once the lightlng changed to LED, the algae growth reduced substantially, but not completely. 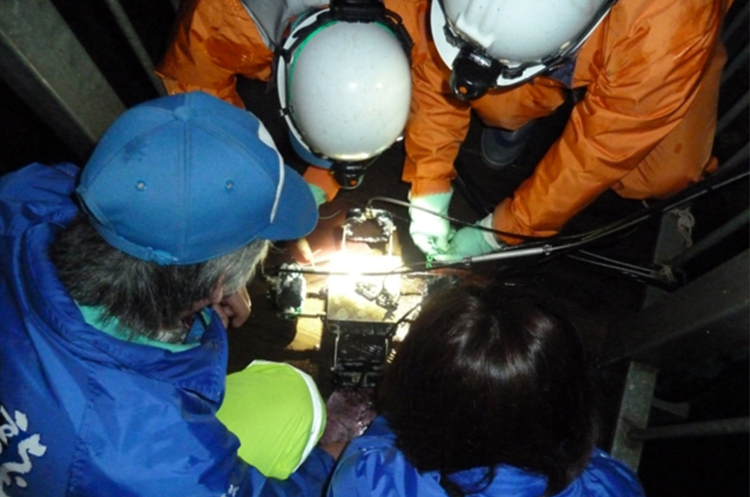 So, operating from a boat, once a month our staff pull out the underwater light and remove the algae. The area open to the public for sightseeing route is 700 m long. In fact, Ryusendo Cave continues to be explored to reveal the whole extent of the cave. Its total length so far confirmed is 3,600 m.
However, this survey indicates that the full length is likely to be more than 5,000 m. So the currently opened route is only a small part of the entire length. Thus, while there are still areas yet to be charted to determine the full length, we know of sections in the upper part, yet open to public, where stalactites are gathered in groups. These are similar to the “Crystal Palace” where pure white stalactite groups extend down, and “Chalk Palace” which spreads above the “Chalk White Assembly Hall” and are now open to the public. Before Ryusendo becoming a tour cave, the “Crystal Palace” was called the “chimney hole”. The explorers of the time climbed up this narrow slope of 40m just by hands and feet, without any lifeline, and carrying only a lantern in the dark. 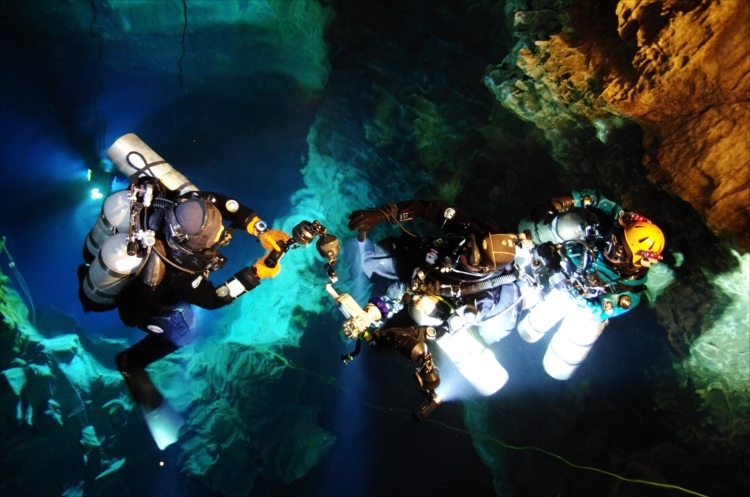 Along with the cavers’ land survey in the cave, professional divers who specialize in cave work have surveyed not only the underground lakes already open to the public, but also the interior areas still closed to tourists. 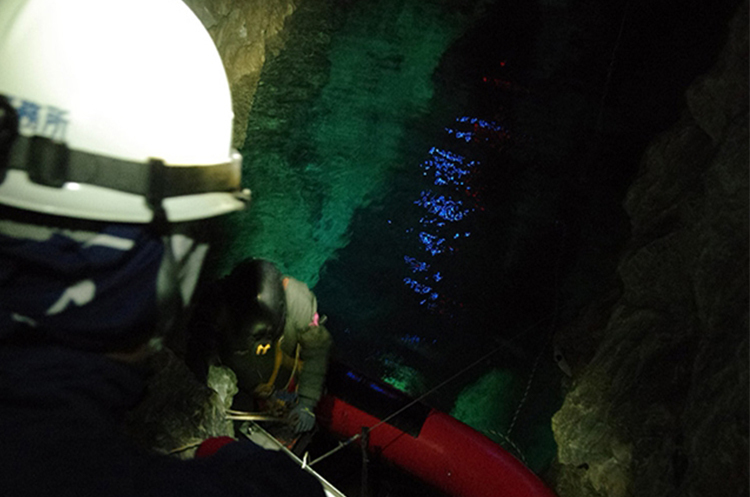 Because of the scale and challenge of this diving survey, and the specialist diving skills needed to negotiate the narrow spaces in the underground lakes, these operations are only undertaken roughly once a year. The date and time of these surveys vary each year, but when they occur in visiting hours, our visitors are delighted to witness the action! This rock is located in the river near the cave entrance. When water levels rise in the cave and we need to determine whether the cave should be closed or not, this rock gives us a handy yardstick without having to go inside the cave. The rock is called the “Sankakuiwa (triangle or pyramid rock)” since it is triangle-shaped. When the head of the rock is hidden below the water surface, it means that the amount of water in the cave has reached the level of submerging the tour passage. Once upon a time, one day suddenly began to be heard the strange sound of “Shuu, Shuu, Shuu…” coming from around the foot of U’reirayama (Mt. U’reira). Naturally, everyone was very surprised, wondering what the sound could be. At the end, with ever-louder hissing, ‘S-s-s-s, S-s-s-s, S-S-S-S…, the rocky mountain split apart and a giant dragon-snake (Ryu) leapt out. The giant dragon-snake immediately flew up to heaven and disappeared. Later, from the hole where the dragon-snake had emerged, a beautiful spring (Sen) water began to flow out continuously. When tasted, the spring water was cold and very delicious. And everybody was very happy. In this way, the “Ryu-Sen-Do (Dragon-Spring-Cave)” was created. 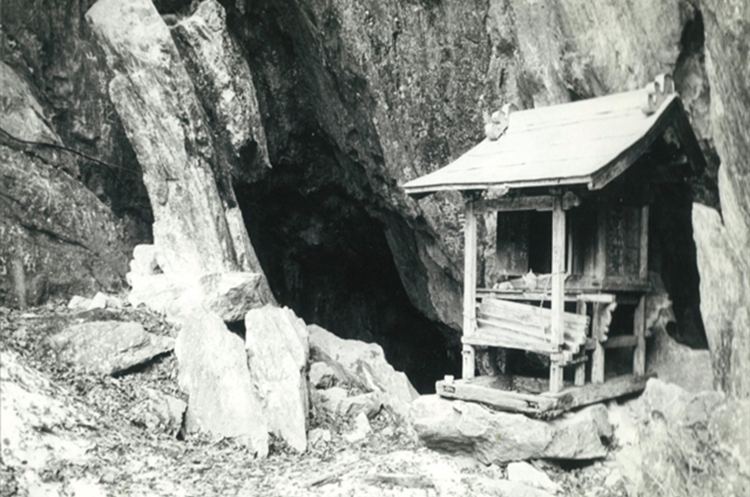 The Shizugawa Myojin (Shizu-stream Shrine) was dedicated at the old entrance of Ryusendo Cave. 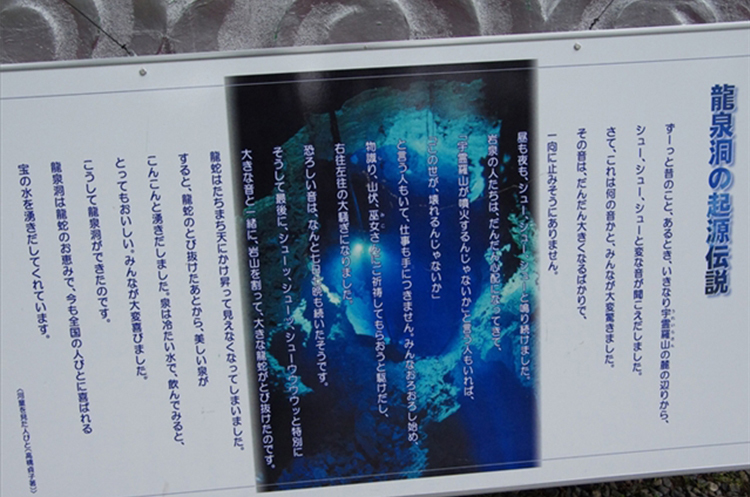 “The Water of Ryusendo Cave” is mentioned in one of Jiro Asada’s books. Immediately after getting up, he rushed to the kitchen and gulped down a liter of mineral water. The water is a blend of the two brands – “Hita Tenryo Water” which is said to have a composition extremely close to that of the sacred spring water of Lourdes, and “Ryusendo Cave Water” which consecutively won the Monde Selection Gold Prize: in other words, amazingly refreshing.